Regular vaccinations performed by your veterinarian, protect your pet from potentially serious and even fatal diseases, like Rabies. Prevention is far less costly than the treatment for the disease itself. Vaccines work by stimulating the body's immune system to react quickly if exposed to the disease and destroy it. It is important to get regular booster vaccines when your pet is due as this protection declines overtime. Rabies: This disease affects the CNS part of the brain, it is severe and often fatal. Carriers of this disease include foxes, racoons, skunks and bats. Distemper: There is no known cure for distemper, so prevention is key. It affects dogs and various wildlife animals. The disease is spread through the air by direct or indirect contact. Parvovirus: This is an extremely contageous virus that mostly affects unvaccinated puppies from ages 6 weeks to 6 months. It can affect the intestinal system as well as the cardiac muscles. Adenovirus (Heptatits): Generally included in the distemper vaccine, it is a DNA virus, causing upper respiratory tract infections, kidney issues and liver issues. Parainfluenza: A respiratory infection, found in areas of high animal population like dog kennels/parks. Leptospirosis: This disease has over 260 strains, 8 of which are infectious. It is present in most pet's environments and is carried by rats/ various species of wildlife and livestock. It affects the kidneys, and animals that are infected can shed the virus into the environment for months to years. Infection is easily caused simply by an animal smelling urine on the ground, walking through it and licking it off their paws/fur, and drinking standing water that rain has washed it into. Panleukopenia: The leading cause of death in kittens, this disease if often referred to as feline distemper, although there is no correlation with the canine distemper disease. It is present wherever susceptible animals are, usually in areas of high population, like multi-pet house holds, catteries, or areas of poor sanitation and ventilation. Rhinotracheitis: Upper respiratory tract infection, also called feline herpes virus, also affects cats in multi-pet households or areas of poor sanitation and overcrowding. Calicivirus: A respiratory disease affecting the lungs, nasal passages and mouth causing ulcers on the tongue and intestines. Rabies: Same viral structure and infectious properties as canine rabies. FIV: Feline Immunodeficiency Virus, attacks the immune system hindering it's ability to fight off infections and other diseases. Infected cats will frequently be sickly and can only be treated symptomatically. Others include: Chlamydophilia, Leukemia, and Bordatella (Kennel Cough). The stimulation from vaccines of the body's immune system can cause some rare side effects, that are generally much less severe than the disease itself. Soreness of injection site, fever, and allergic reactions are the most common types of vaccines reactions. Why do puppies and kittens need so many boosters? In utero, puppies and kittens receive maternal immunity from their mothers and collostrum from their milk when they're born. This immunity generally lasts until about 8 weeks of age, however, it can decrease as early as 6-7 weeks or not until 14-16 weeks of age. 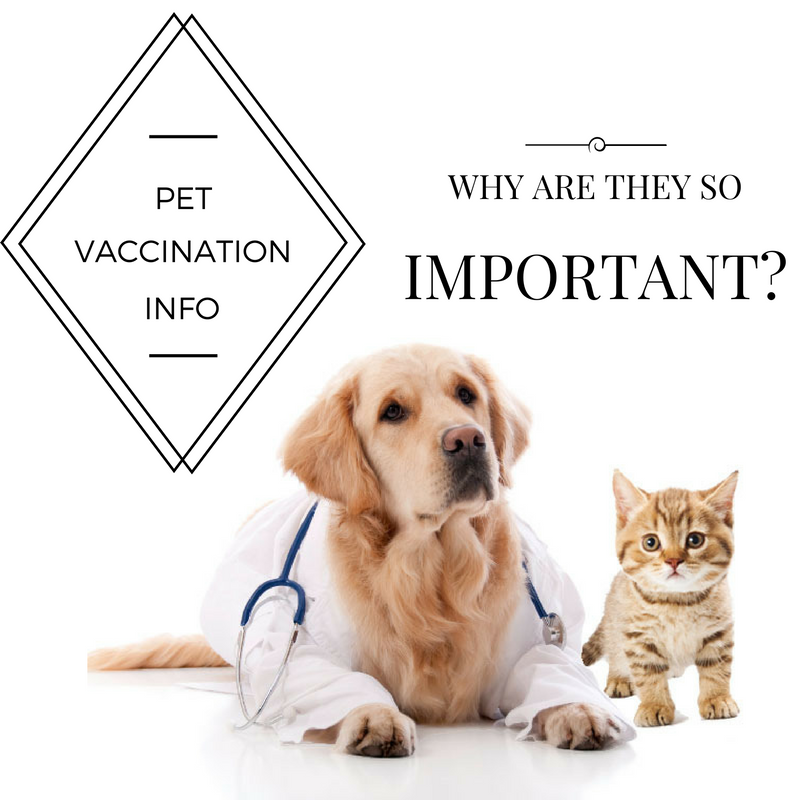 It is not possible for a veterinarian to determine whether or not a puppy or kitten still has maternal immunity during a physical exam, this is why it is necessary in all cases to vaccinate your puppy or kitten every 3 weeks until they are at an age where they will respond to vaccines, which is approximately 16 weeks of age. Leaving a puppy/kitten unvaccinated during this time frame leaves them vulnerable and susceptible to deadly diseases. Therefore, it is necessaary to get your new puppy or kitten all of their booster shots in order to raise their level of antibodies in their system to be adequately protected from a range of serious diseases.